Here we will discuss how to create a SharePoint 2013 publishing site. Web Content Management (WCM) in SharePoint Server 2013 consists of features and functionality that you use to configure, customize, optimize, and publish site collections, sites, and pages. When we talk about publishing sites in SharePoint Server 2013, we are referring to sites that use one or more of these features to author and deploy branded artifacts, content, and configuration files to Internet, intranet, and extranet sites. 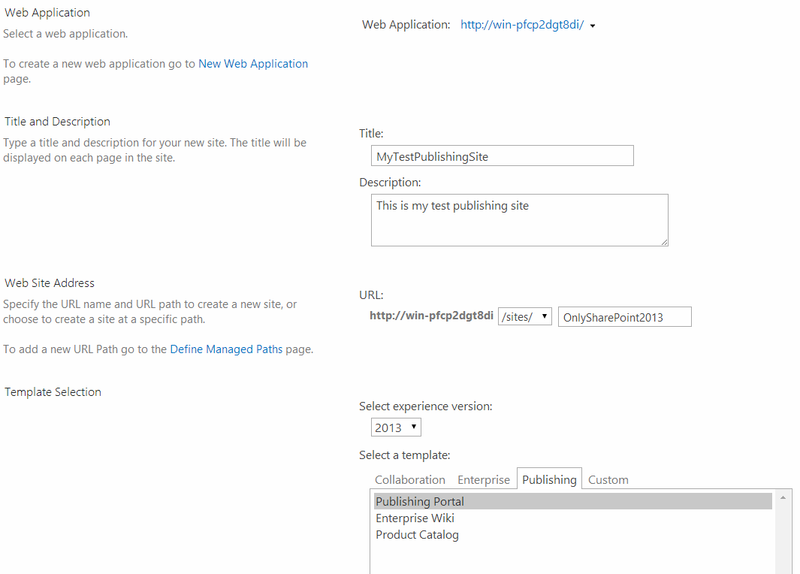 Open SharePoint 2013 Central Administration, then From the Application Management click on Create site collections. This will open the Create Site Collection Page. In this page select the web application for which you want to create the site collection, Give a Title, Description and choose the URL. In SharePoint 2013, you can chose the version like 2013 or 2010 and the from the Template Select Publishing category and then select Publishing Portal. Then chose a Primary Site Collection Administrator and Secondary Site Collection Administrator as shown in the fig below. Then click on OK. The publishing site will got created. Check out this article to know more about Difference between Team site and Publishing site in SharePoint 2010.